I have never been much of a cook. I’ve been more of a reheater, an open the box and follow the directions maker of food. Over the last several months, that’s been changing. This past summer, after months of seeing many Facebook friends extol the virtues of something called the Instant Pot, I succumbed to peer pressure and bought one when it went on sale for a great price. I had it delivered to my Mom’s house, as that sale happened when I was there visiting her in July. What with everything else going on after that, it took me a while to actually try using my new toy. The first thing I made was hard boiled eggs, and it was a revelation. No waiting for water to boil. No having to decide if that was really a rolling boil. No having to time precisely. Put a cup of water in the pot, put the eggs on a trivet over the water, seal the lid of the pot, set it and walk away until it beeps. The eggs were perfectly done and easy to peel. And the process is repeatable. No guesswork. I like that. Emboldened, I looked for recipes online with a small number of ingredients to start trying things other than eggs. 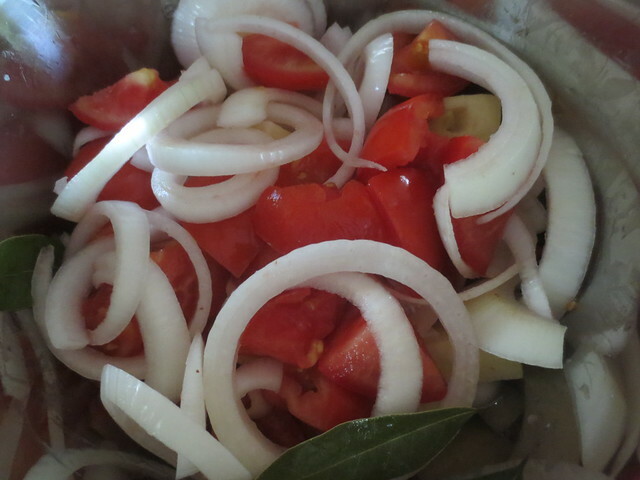 One of the first ones I attempted was a potato and tomato stew, which involved just a bit of chopping and throwing those things into the pot with some spices (see bay leaves below). It wasn’t the best thing I’d ever eaten, but it was edible, and easy, and made me want to try more things. And try more things I did, and now I use the Instant Pot two or three times most weeks, with a lemon coconut curry chicken being a particular favorite—I started with a recipe I found online but have tweaked it to work better for us. I’m looking forward to trying more elaborate recipes in the months to come, having gained confidence from how well the simple ones I’ve mastered so far have turned out. And two more of my friends just bought Instant Pots today (there was another sale), so I’m also looking forward to sharing ideas about what to make with more people I know. Hmmm…I may have to look into this!